I couldn’t resist this delicata squash when I passed it in the grocery store. I imagined it roasted with thyme then topped with feta, pomegranate seeds, and pepitas. It was a beautiful side dish and it tasted wonderful. We all, kids included, enjoyed this squash and it paired nicely with roasted chicken and autumn salad I served it with. Scrub and clean the squash; cut into rings. Use a pairing knife to carefully cut out the seeded center. Place the rings onto the prepared baking sheet. Toss with olive oil then season with the thyme leaves, sea salt, and freshly cracked pepper, to taste. Place into the oven for 15-20 minutes. 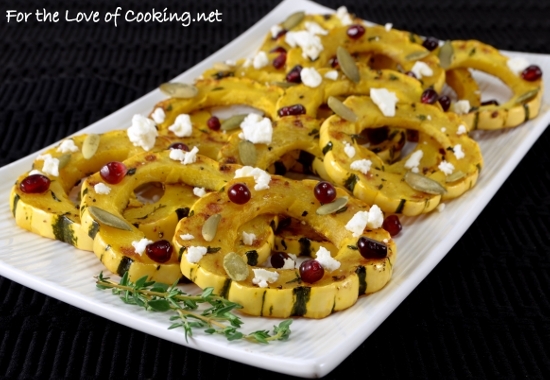 Flip the squash rings then continue roasting for another 7-10 minutes. Remove from the oven and place on a serving plate. 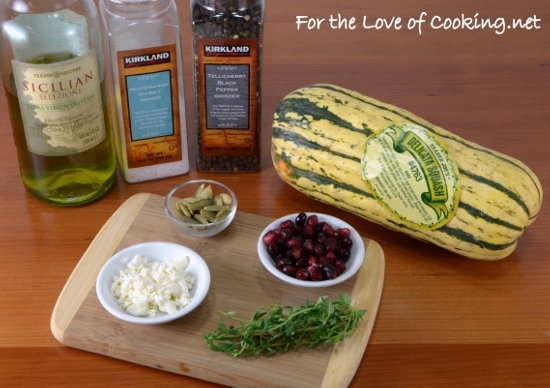 Sprinkle the top with the pomegranate seeds, pepitas, and feta cheese. Serve immediately. Enjoy. 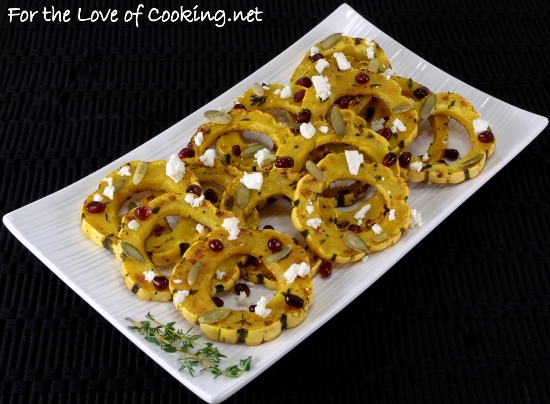 Scrub and clean the squash; cut into rings. Use a pairing knife to carefully cut out the seeded center. Place the rings onto the prepared baking sheet. Toss with olive oil then season with the thyme leaves, sea salt, and freshly cracked pepper, to taste. Place into the oven for 15-20 minutes. 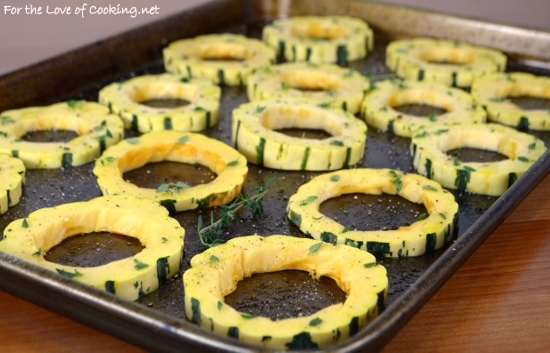 Flip the squash rings then continue roasting for another 7-10 minutes. How festive and pretty! I bet these pumpkin slices taste as delicious as they look, Pam. This is one of my favorite squashes. I usually cut it in half the long way, clean it, slather it with butter and then either cook it in the microwave or roast it. Then I get a whole half piece to myself! Yummy! i think i’m comfortable saying that delicata squash is my favorite winter squash, and this is a beautiful and tasty way to prepare it! I love doing different things with squash. You have used lots of interesting, delicious ingredients.